This page, updated monthly, will let you know some of the things that you can look out for in the night sky. 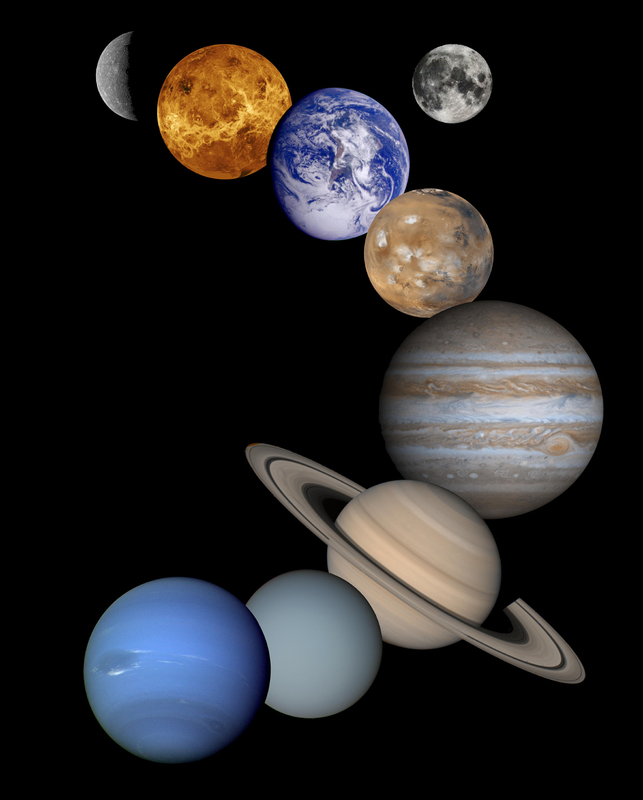 It lists the phases of the Moon, where you will see the naked-eye planets and describes some of the prominent constellations in the night sky during the month. which, over time, will provide useful and, I hope, interesting articles for all amateur astronomers. A further aim is to update and add new material to link with the books recently published by Cambridge University Press and which are described on the home page of the digest. It now includes nearly 50 illustrated articles. 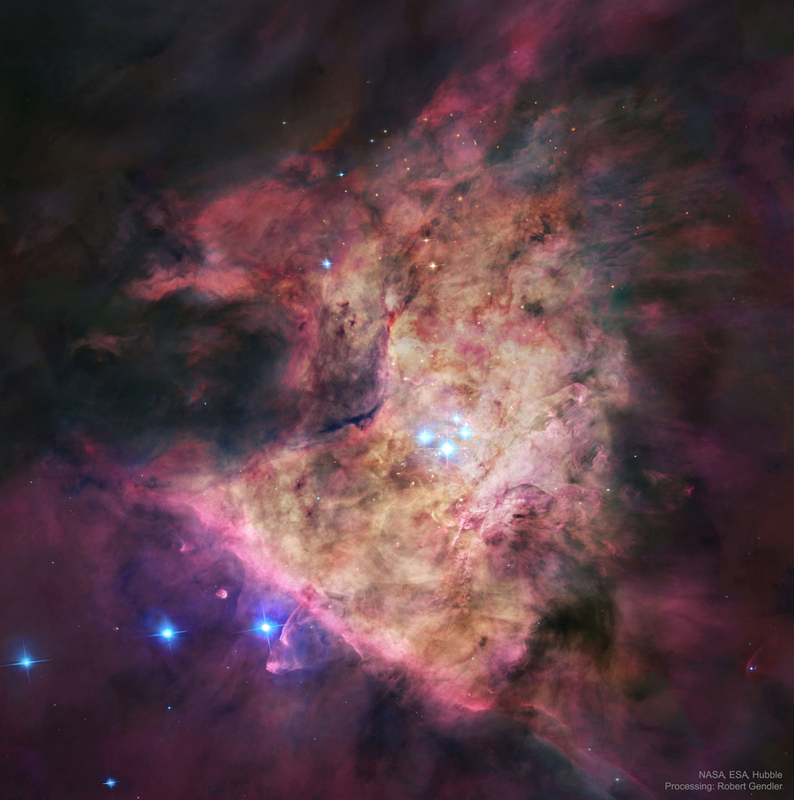 This is a wonderful image of the 'Trapezium' at the heart of the Orion Nebula. Lying within a radius of ~ 1.5 light years, ultraviolet light from the four hot, massive, stars powers the star formation region. 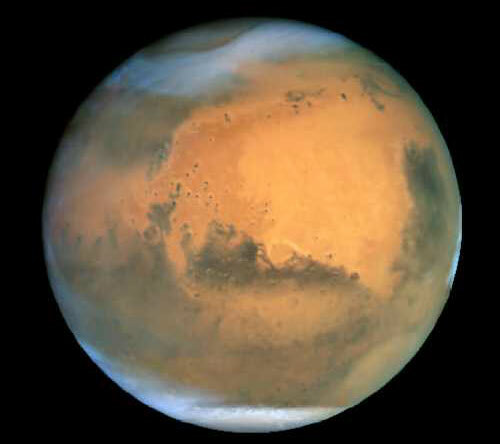 Mars came to its closest opposition to Earth since 2003 on the 27th July but, sadly two things have conspired to limit our views. From the UK its maximum elevation when on the meridian was only 12 degrees when observed from a latitude of +52 degrees. Thus the atmosphere has hindered our view and the use of an Atmospheric Dispersion Corrector may well help to alleviate its effects. 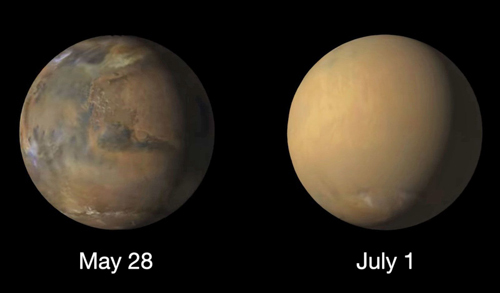 The second problem was that, as sometimes happens, Mars has suffered a major dust storm which, at the end of July, was making it very difficult to observe any features on the surface. These can happen every six to eight years and can last for several months. A small scale dust storm began on May 30th and, by the 20th of June, had engulfed the whole planet. 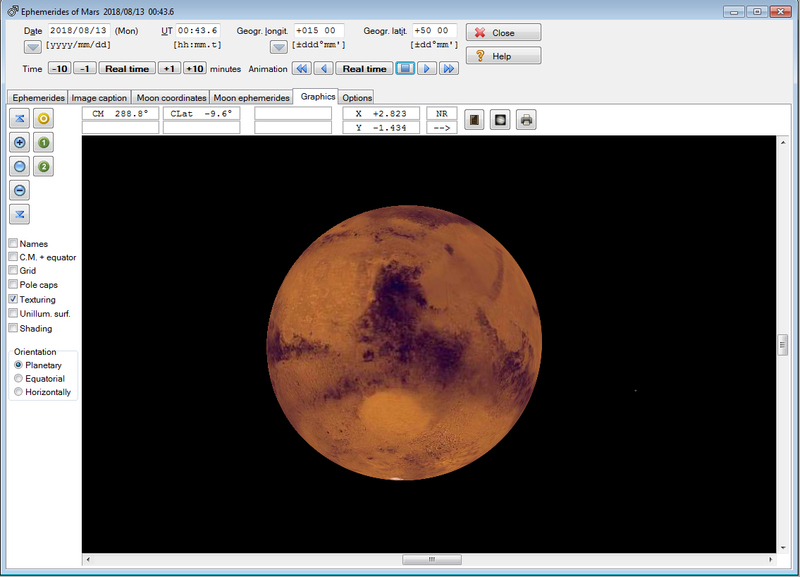 Happily, the dust storm has now subsided and so details on the surface such as Syrtis Major and the Hellas Basin will be visible in small telescopes. WinJUPOS Mars chart showing Syrtis Major. Saturn which reached opposition on the 27th of June, is now low (at an elevation of ~14 degrees) in the south as darkness falls lying above the 'teapot' of Sagittarius. Held steady, binoculars should enable you to see Saturn's brightest moon, Titan, at magnitude 8.2. 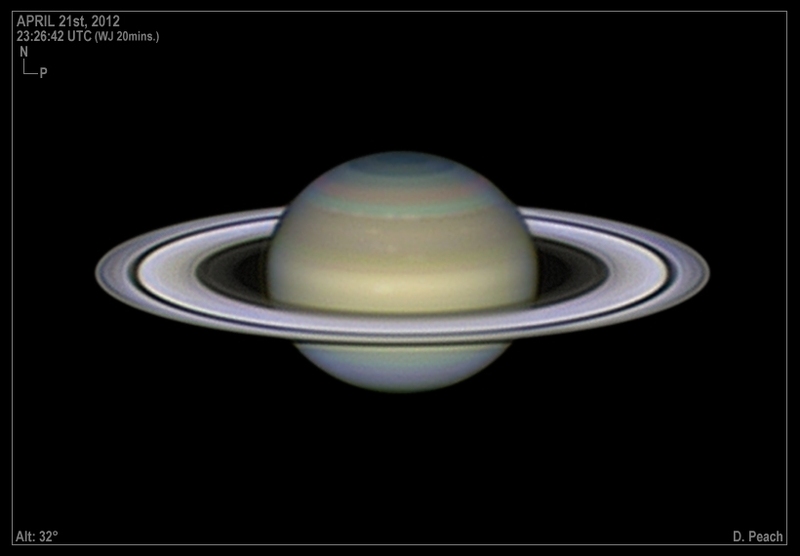 A small telescope will show the rings with magnifications of x25 or more and one of 6-8 inches aperture with a magnification of ~x200 coupled with a night of good "seeing" (when the atmosphere is calm) will show Saturn and its beautiful ring system in its full glory. 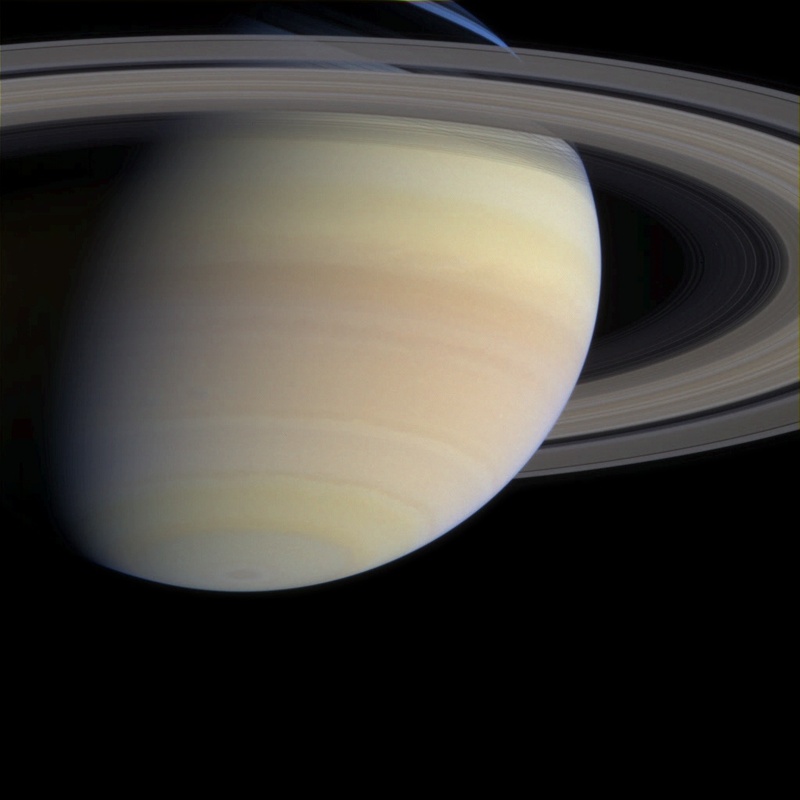 As Saturn rotates quickly with a day of just 10 and a half hours, its equator bulges slightly and so it appears a little "squashed". Like Jupiter, it does show belts but their colours are muted in comparison. The thing that makes Saturn stand out is, of course, its ring system. The two outermost rings, A and B, are separated by a gap called Cassini's Division which should be visible in a telescope of 4 or more inches aperture if seeing conditions are good. Lying within the B ring, but far less bright and difficult to spot, is the C or Crepe Ring. Due to the orientation of Saturn's rotation axis of 27 degrees with respect to the plane of the solar system, the orientation of the rings as seen by us changes as it orbits the Sun and twice each orbit they lie edge on to us and so can hardly be seen. This last happened in 2009 and they are currently at an angle of 26 degrees to the line of sight. The rings will continue to narrow until March 2025 when they will appear edge-on again. See more of Damian Peach's images: Damian Peaches Website"
There are two very nice objects to spot with binoculars high in the sky after dark this month. Two thirds of the way up the right hand side of the 4 stars that make up the "keystone" in the constellation Hercules is M13, the best globular cluster visible in the northern sky. 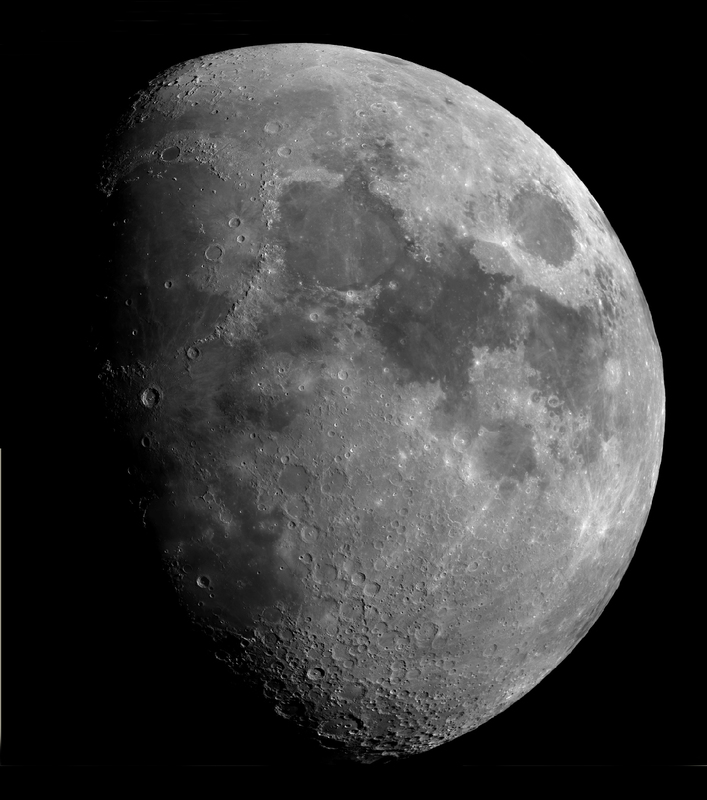 The 15 minute exposure image on right was taken by the author using a 127 mm APO refractor and SBIG 8.3 megapixel CCD camera. Just to the left of the bright star Vega in Lyra is the multiple star system Epsilon Lyrae often called the double-double. With binoculars a binary star is seen but, when observed with a telescope, each of these two stars is revealed to be a double star - hence the name! 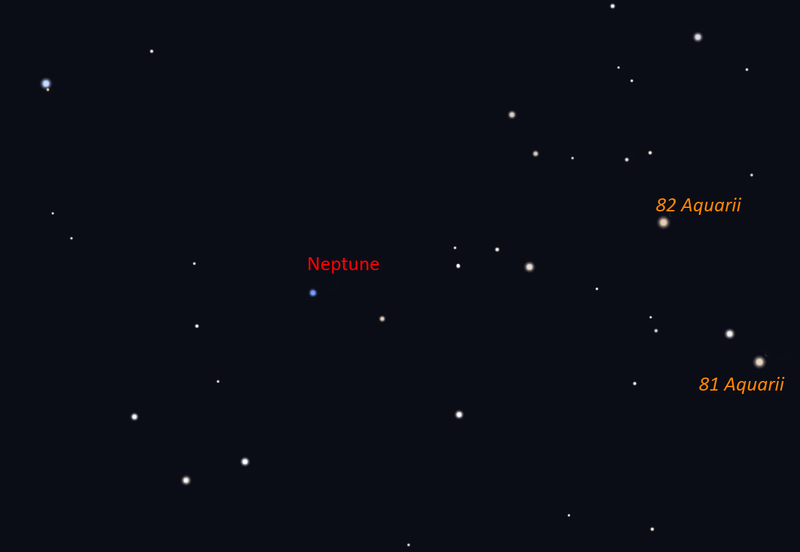 September - a good month to observe Neptune with a small telescope. September - evening: find the 'Coathanger'. 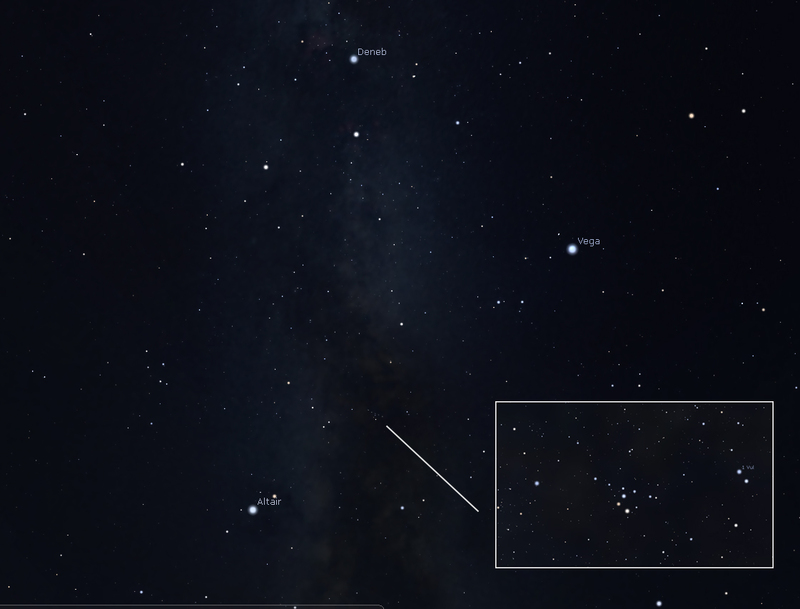 Looking upwards after dark you should spot the three stars making up the 'Summer Triangle'. 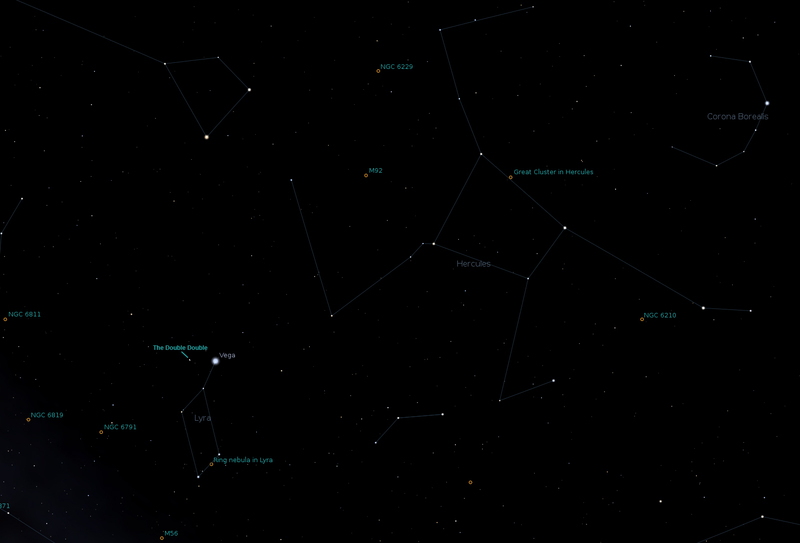 The lowest is Altair in Aquilla, up to its right is Vega in Lyra and over to its left is Deneb in Cygnus. 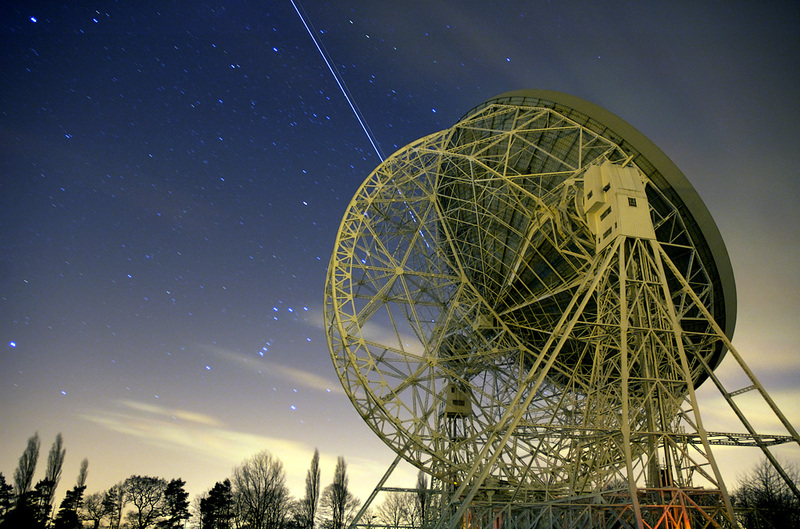 With binoculars sweep upwards about one third of the way from Altair towards Vega. 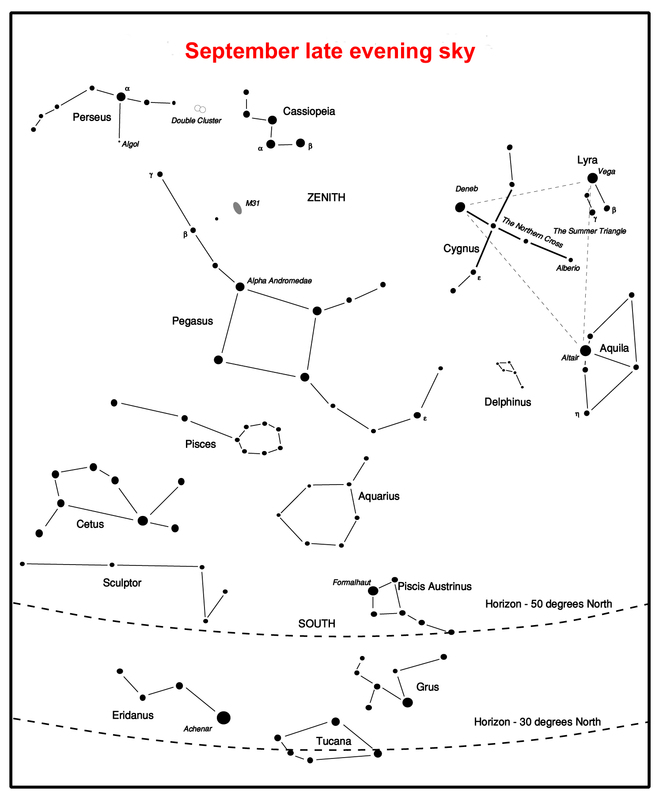 You should spot a nice asterism, formally 'Brocchi's Cluster' but usually called the Coathanger. It is formed of a straight line of six stars below which is a 'hook' of four stars. A pretty object! 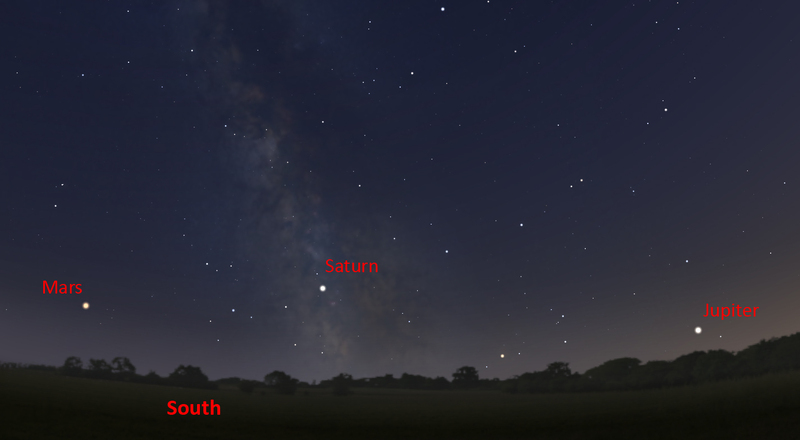 September first week - after sunset: three planets towards the south and west. If clear after sunset one should be able to see Jupiter setting in the West, Saturn lying due South, and Mars in the South southeast. September 8th - before dawn : Mercury below a thin crescent Moon. Mercury below a thin crescent Moon. 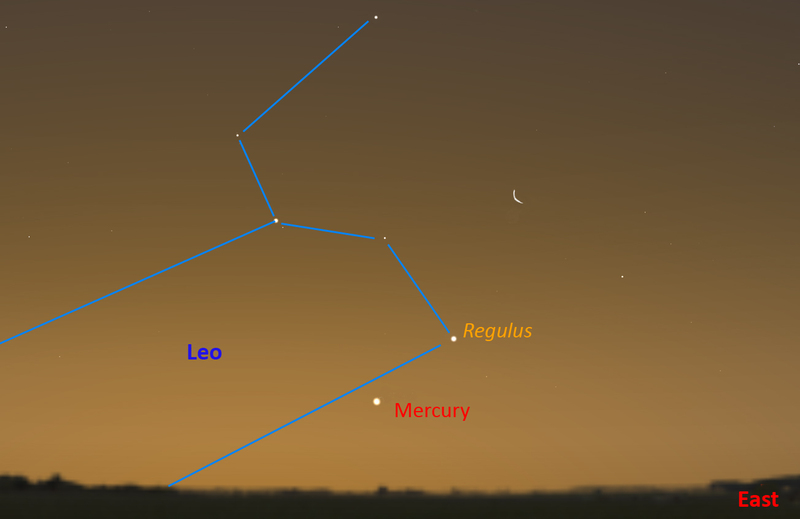 If clear before dawn on the 8th, look for Mercury low in the east just below a thin crescent Moon. Binoculars might be needed but please do not use them after the Sun has risen. 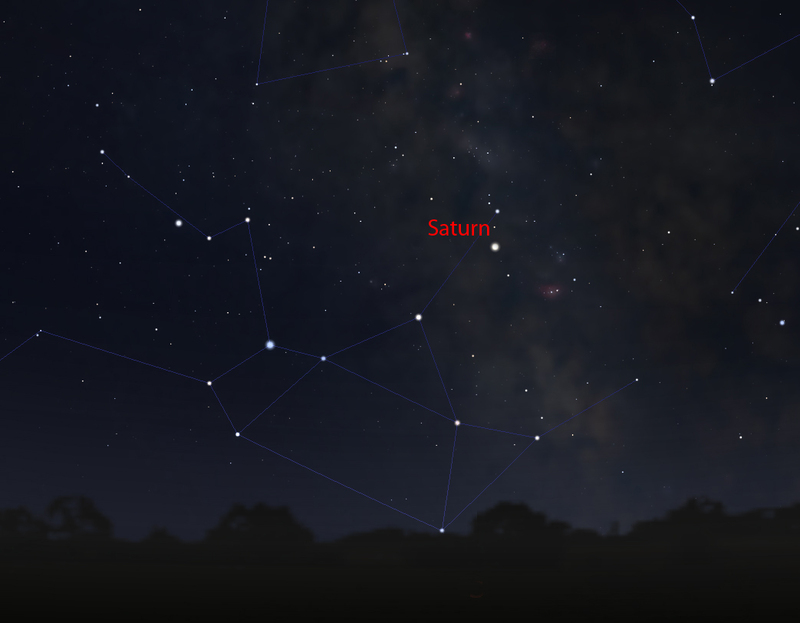 September 17th - early evening : Saturn below a first quarter Moon. Saturn below a first quarter Moon. 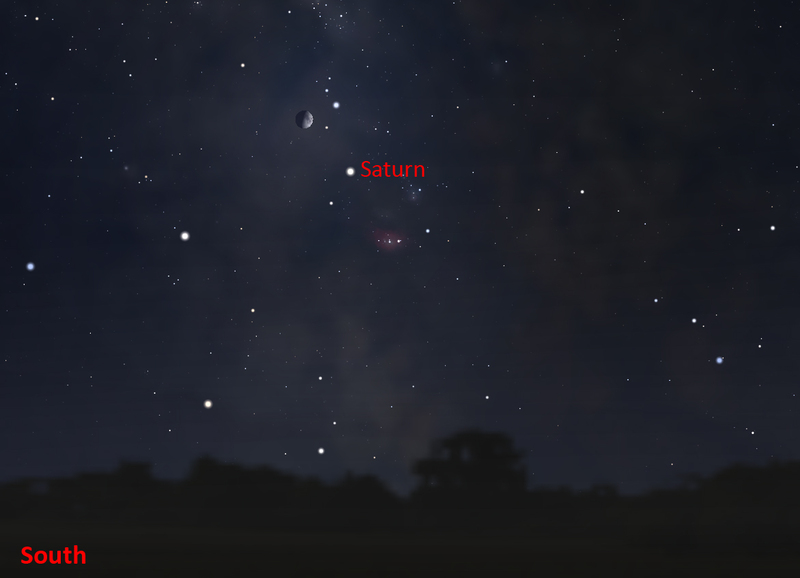 This evening, if clear, Saturn will be seen just below a first quarter Moon - a nice photo opportunity! September 18th - evening : Mars to the lower left of a waxing gibbous Moon. This evening, if clear, Mars will be seen down to the left of a waxing gibbous Moon. 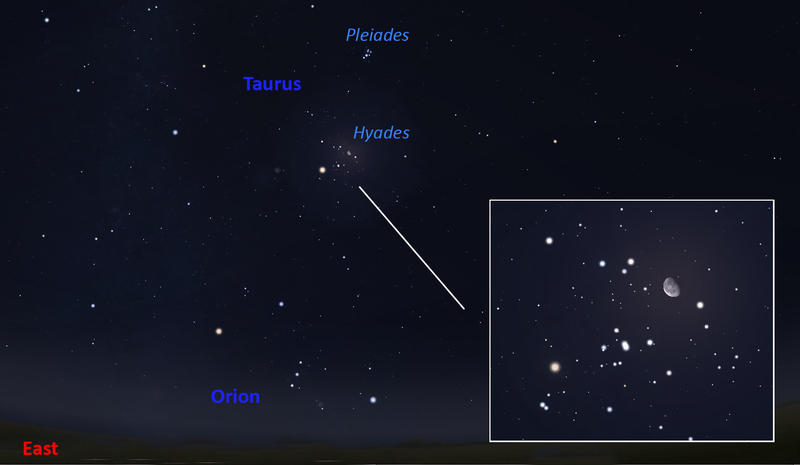 September 29th - late evening : the Moon amongst the Hyades Cluster. As Taurus rises, one should be able to spot (if clear!) 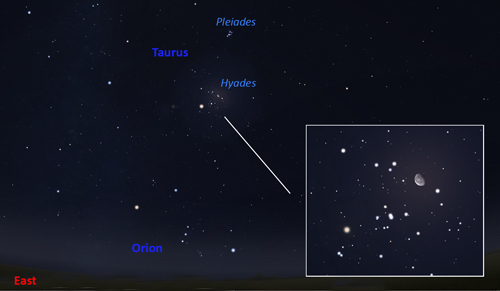 a waning gibbous Moon amongst the Hyades Cluster. 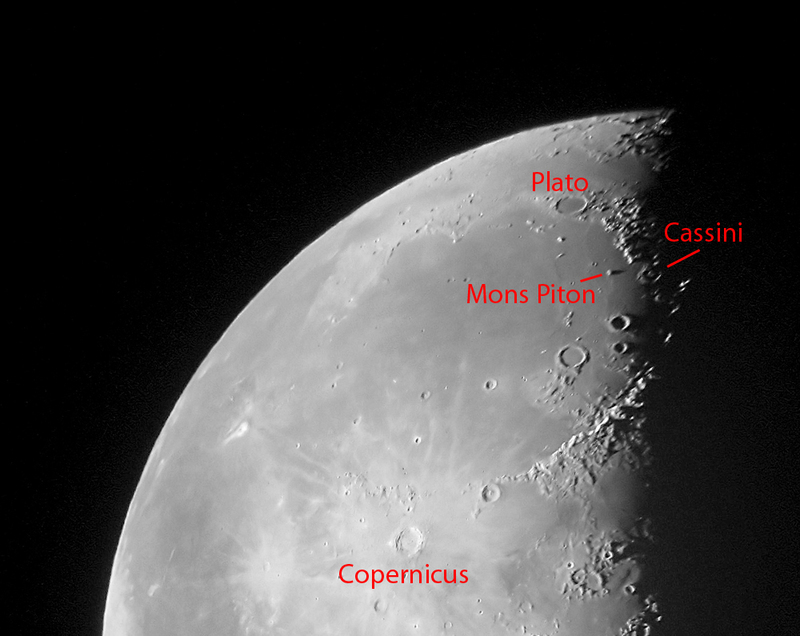 Best seen after First Quarter, Mons Piton is an isolated lunar mountain located in the eastern part of Mare Imbrium, south-east of the crater Plato and west of the crater Cassini. It has a diameter of 25 km and a height of 2.3 km. Its height was determined by the length of the shadow it casts. Cassini is a 57km crater that has been flooded with lava. The crater floor has then been impacted many times and holds within its borders two significant craters, Cassini A, the larger and Cassini B. North of Mons Piton can be seen a rift through the Alpine Mountains (Montes Alpes). Around 166 km long it has a thin rille along its center. 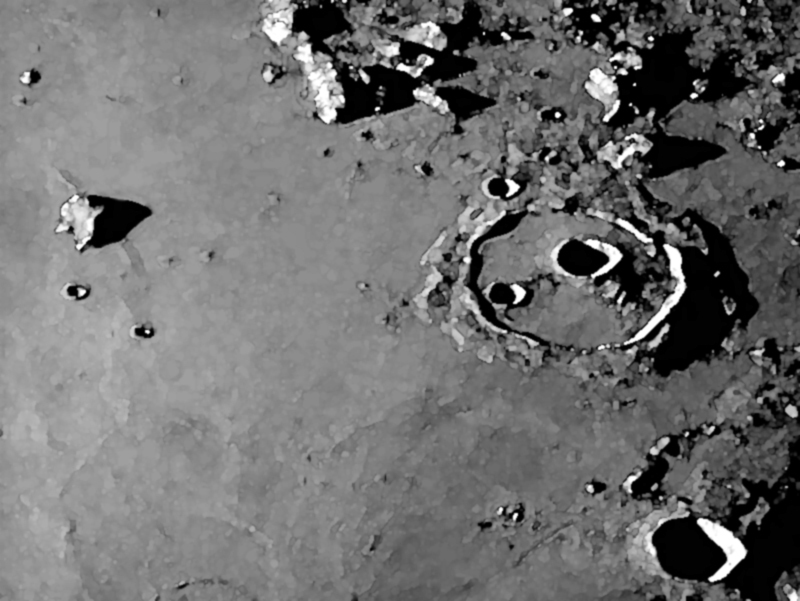 I have never seen it but have been able to image it as seen in the lunar section. Planetary Nebula M82, imaged by Daniel Duggan. This image was taken using the Faulkes Telescope North by Daniel Duggan - for some time a member of the Faulkes telescope team. 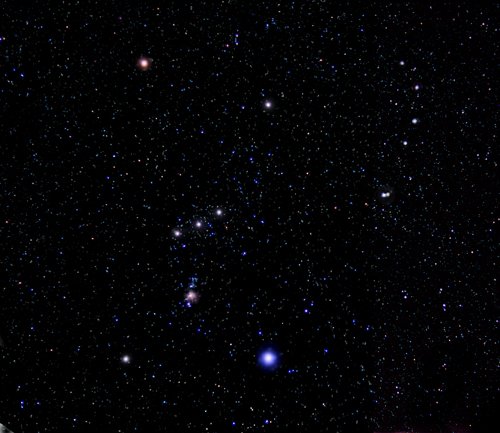 Lying at at distance of 2.3 thousand light years in the constellation Lyra, it is the remnant of a star like our Sun. The core of the star has contracted down to an object about the size of the Earth supported by electron degeneracy pressure and is seen in the centre of the object. The outer parts of the star were blasted out into space forming the "ring" (or torus) that we see. Though showing very well in images, the central "star", called a "White Dwarf" is hard to see visually. Learn more about the Faulkes Telescopes and how schools can use them: Faulkes Telescope"
The International Space Station and Jules Verne passing behind the Lovell Telescope on April 1st 2008. Note: I observed the ISS three times recently and was amazed as to how bright it has become. The Moon at 3rd Quarter. 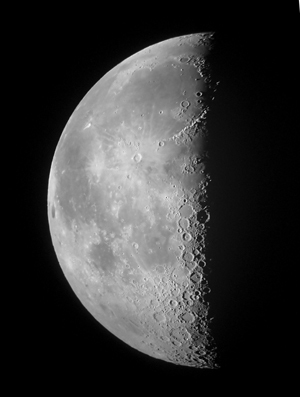 Image, by Ian Morison, taken with a 150mm Maksutov-Newtonian and Canon G7. Just below the crator Plato seen near the top of the image is the mountain "Mons Piton". It casts a long shadow across the maria from which one can calculate its height - about 6800ft or 2250m. The 9 day old Moon. 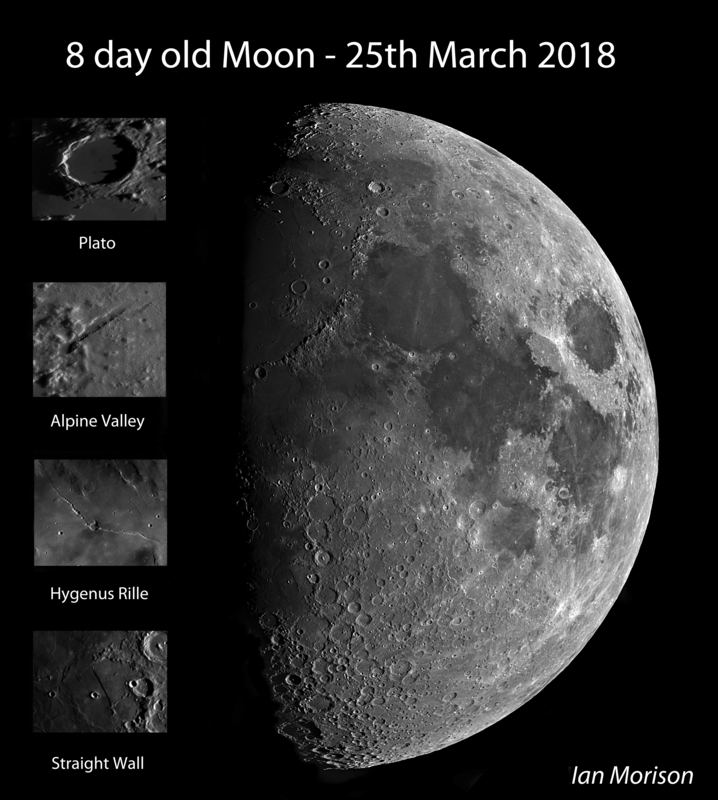 To mark International Year of Astronomy, a team of British astronomers have made the largest lunar image in history and gained a place in the Guinness Book of Records! The whole image comprises 87.4 megapixels with a Moon diameter of 9,550 pixels. The resolution of ~0.4 arc seconds allows details as small as 1km across to be discerned! 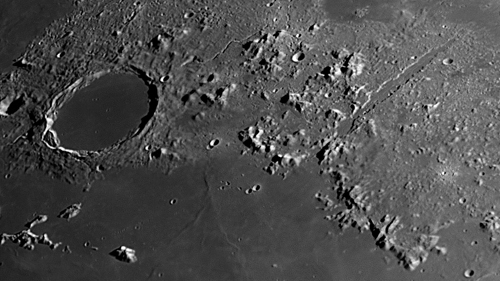 The superb quality of the image is shown by the detail below of Plato and the Alpine Valley. 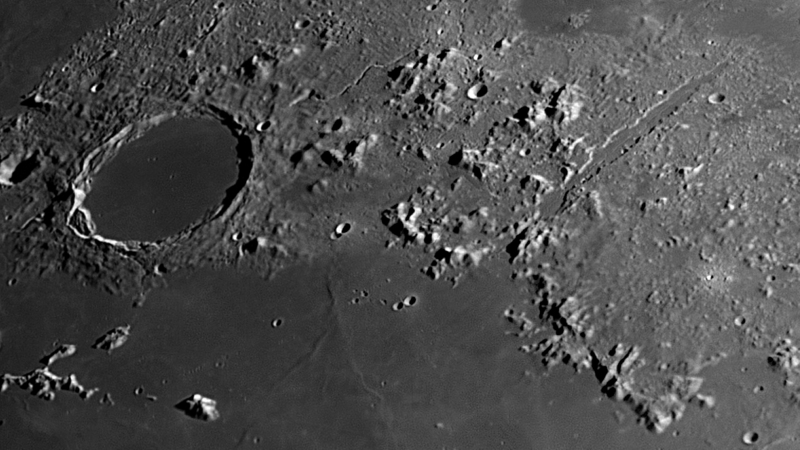 Craterlets are seen on the floor of Plato and the rille along the centre of the Alpine valley is clearly visible. The image quality is staggering! The team of Damian Peach, Pete lawrence, Dave Tyler, Bruce Kingsley, Nick Smith, Nick Howes, Trevor Little, David Mason, Mark and Lee Irvine with technical support from Ninian Boyle captured the video sequences from which 288 individual mozaic panes were produced. These were then stitched together to form the lunar image. Plato and the Alpine Valley. Please follow the link to the Lunar World Record website and it would be really great if you could donate to Sir Patrick Moore's chosen charity to either download a full resolution image or purchase a print. 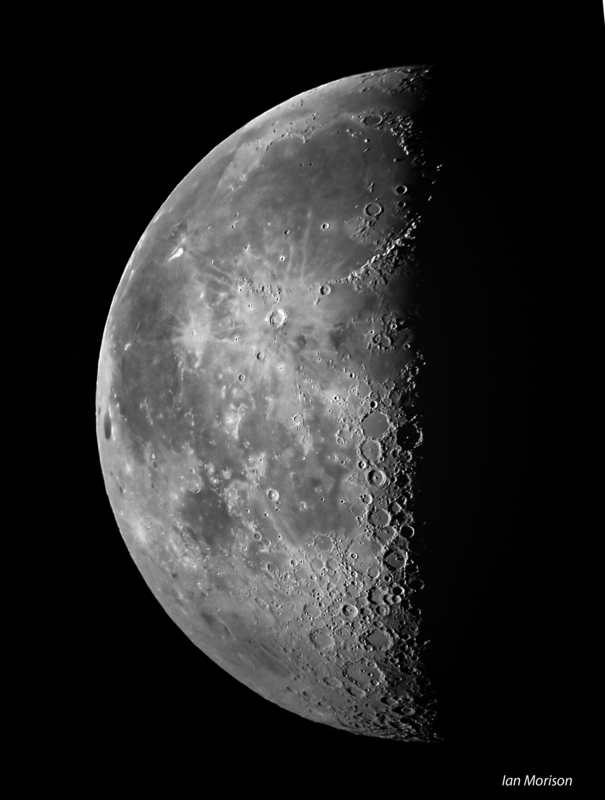 The 8 day old Moon imaged by Ian Morison. 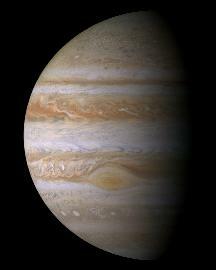 Jupiter can be seen in the west soon after sunset at the start of the month. 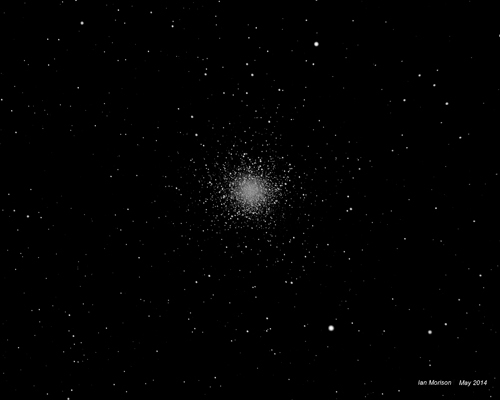 It shines at magnitude -1.9 (falling to -1.8 during the month) and has a disk some 35 (falling to 33) arc seconds across. Jupiter's equatorial bands, sometimes the Great Red Spot and up to four of its Gallilean moons will be visible in a small telescope. Sadly, moving slowly eastwards in Libra during the month, Jupiter is heading towards the southern part of the ecliptic and will only have an elevation of ~10 degrees after sunset. Atmospheric dispersion will thus hinder our view and it might be worth considering purchasing the ZWO Atmospheric Dispersion Corrector to counteract its effects. Saturn will be visible in the south at an elevation of ~14 degrees after sunset at the beginning of September. Its disk has an angular size of 17.5 arc seconds falling to 16.5 during the month. Its brightness reduces from +0.4 to +0.5 magnitudes as the month progresses. The rings were at their widest some months ago and are still, at 25 degrees to the line of sight, well open and spanning ~2.5 times the size of Saturn's globe. Saturn, lying in Sagittarius, halts its retrograde motion on the 6th within a few degrees of M8, the Lagoon Nebula, and M20, the Trifid Nebula. Sadly, atmospheric dispersion will greatly hinder our view and, as for Jupiter, it might be worth considering purchasing the ZWO Atmospheric Dispersion Corrector to counteract its effects. Mercury can be seen low in the east-northeast some 30 to 45 minutes before sunrise during the first week of September. 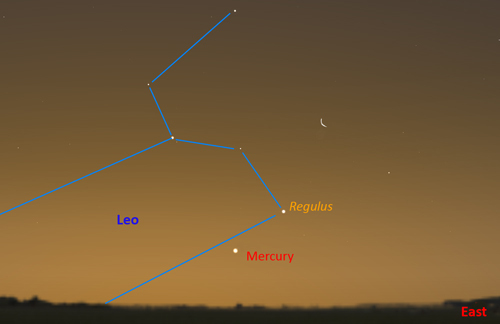 On the 5th and 6th, Mercury, shining at magnitude -1, is just over one degree from Regulus in Leo (at magnitude +1). 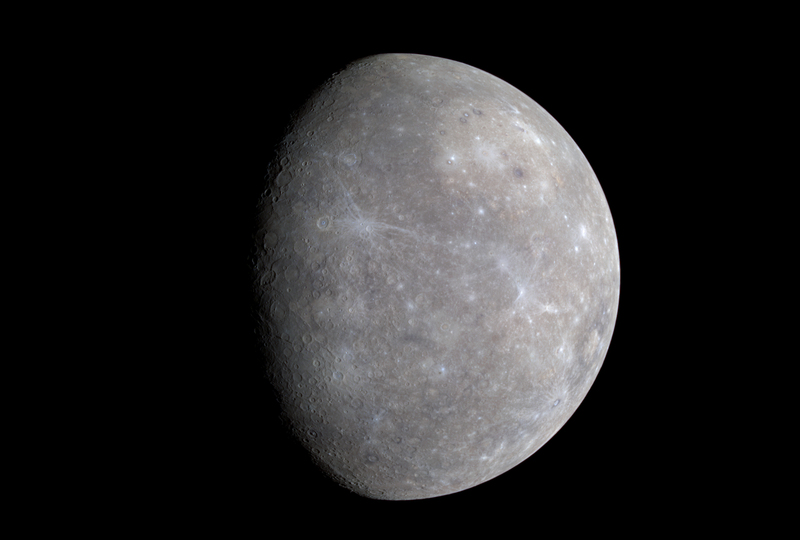 Around the 11th of the month Mercury disappears into the Sun's glare as it moves towards superior conjunction (behind the Sun) on the 20th of the month. Mars, which ceased it retrograde motion westwards in Capricornus (and just moving into Sagittarius)at the beginning of the month made its closest approach to Earth since 2003 on the night of July 30th/31st. 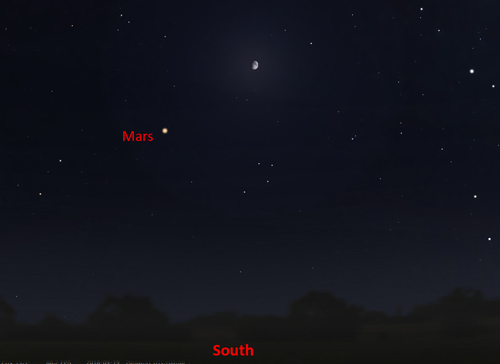 After sunset, Mars can be seen just east of south shining at a magnitude of -2.1 but this falls to -1.3 by month's end. Its angular size is 21 arc seconds at the start of the month falling to 16 arc seconds by the start of October. With a small telescope it should be possible to spot details, such as Syrtis Major, on its salmon-pink surface. From the UK, it will only reach an elevation of ~14 degrees when due south and so, sadly, the atmosphere will hinder our view. Another reason for purchasing a ZWO Atmospheric Dispersion corrector? Venus, was at greatest elongation east on the 17th August but is now only seen low in the west southwest after sunset setting at about 80 (reducing to 45) minutes after the Sun. The planet brightens from -4.6 to a dazzling -4.8 magnitudes making it easier to spot in the Sun's glare. Binoculars might be needed to spot it but please do not use them until after the Sun has set. Its angular size increases from 29 to 46 arc seconds during the month as the percentage illuminated disk (its phase) narrows from 40% to just 17%. This map shows the constellations seen towards the south in late evening. To the south in early evening moving over to the west as the night progresses is the beautiful region of the Milky Way containing both Cygnus and Lyra. Below is Aquilla. The three bright stars Deneb (in Cygnus), Vega (in Lyra) and Altair (in Aquila) make up the "Summer Triangle". East of Cygnus is the great square of Pegasus - adjacent to Andromeda in which lies M31, the Andromeda Nebula. To the north lies "w" shaped Cassiopeia and Perseus. 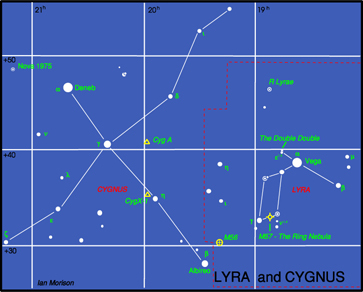 Lyra is dominated by its brightest star Vega, the fifth brightest star in the sky. It is a blue-white star having a magnitude of 0.03, and lies 26 light years away. It weighs three times more than the Sun and is about 50 times brighter. It is thus burning up its nuclear fuel at a greater rate than the Sun and so will shine for a correspondingly shorter time. Vega is much younger than the Sun, perhaps only a few hundred million years old, and is surrounded by a cold,dark disc of dust in which an embryonic solar system is being formed! 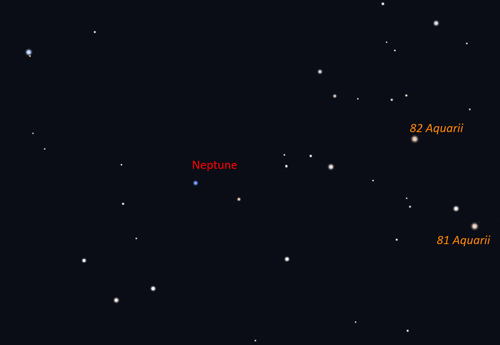 There is a lovely double star called Epsilon Lyrae up and to the left of Vega. A pair of binoculars will show them up easily - you might even see them both with your unaided eye. In fact a telescope, provided the atmosphere is calm, shows that each of the two stars that you can see is a double star as well so it is called the double double! 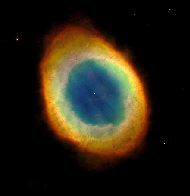 Between Beta and Gamma Lyra lies a beautiful object called the Ring Nebula. It is the 57th object in the Messier Catalogue and so is also called M57. 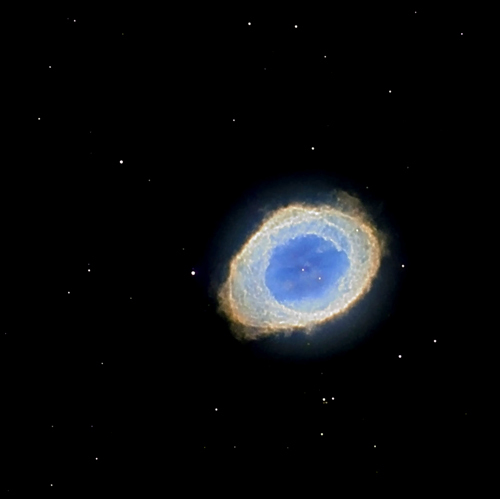 Such objects are called planetary nebulae as in a telescope they show a disc, rather like a planet. But in fact they are the remnants of stars, similar to our Sun, that have come to the end of their life and have blown off a shell of dust and gas around them. The Ring Nebula looks like a greenish smoke ring in a small telescope, but is not as impressive as it is shown in photographs in which you can also see the faint central "white dwarf" star which is the core of the original star which has collapsed down to about the size of the Earth. 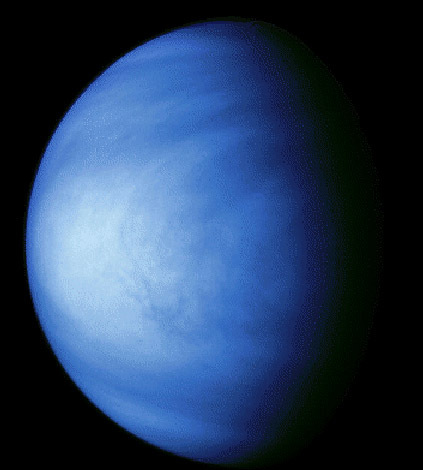 Still very hot this shines with a blue-white colour, but is cooling down and will eventually become dark and invisible - a "black dwarf"! Do click on the image below to see the large version - its wonderful! 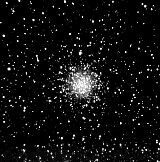 M56 is an 8th magnitude Globular Cluster visible in binoculars roughly half way between Alberio (the head of the Swan) and Gamma Lyrae. It is 33,000 light years away and has a diameter of about 60 light years. 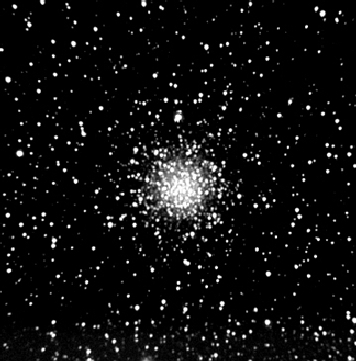 It was first seen by Charles Messier in 1779 and became the 56th entry into his catalogue. Cygnus, the Swan, is sometimes called the "Northern Cross" as it has a distinctive cross shape, but we normally think of it as a flying Swan. Deneb,the arabic word for "tail", is a 1.3 magnitude star which marks the tail of the swan. It is nearly 2000 light years away and appears so bright only because it gives out around 80,000 times as much light as our Sun. In fact if Deneb where as close as the brightest star in the northern sky, Sirius, it would appear as brilliant as the half moon and the sky would never be really dark when it was above the horizon! 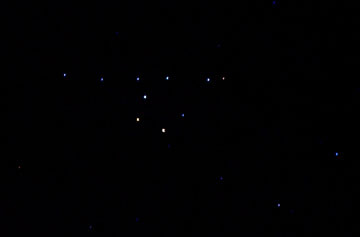 The star, Albireo, which marks the head of the Swan is much fainter, but a beautiful sight in a small telescope. 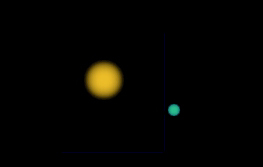 This shows that Albireo is made of two stars, amber and blue-green, which provide a wonderful colour contrast. 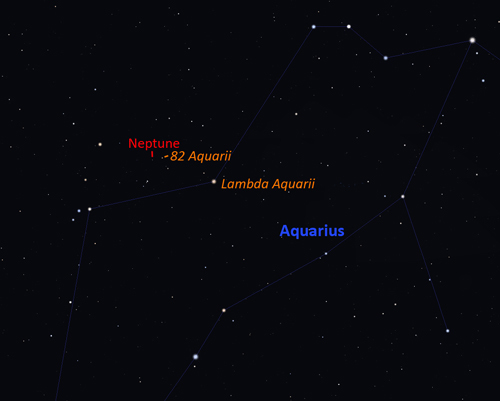 With magnitudes 3.1 and 5.1 they are regarded as the most beautiful double star that can be seen in the sky. Cygnus lies along the line of the Milky Way, the disk of our own Galaxy, and provides a wealth of stars and clusters to observe. 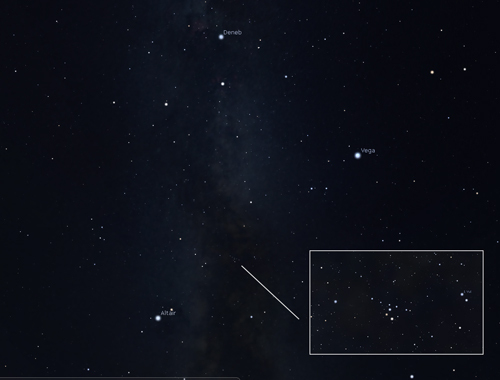 Just to the left of the line joining Deneb and Sadr, the star at the centre of the outstretched wings, you may, under very clear dark skys, see a region which is darker than the surroundings. This is called the Cygnus Rift and is caused by the obscuration of light from distant stars by a lane of dust in our local spiral arm. the dust comes from elements such as carbon which have been built up in stars and ejected into space in explosions that give rise to objects such as the planetary nebula M57 described above. 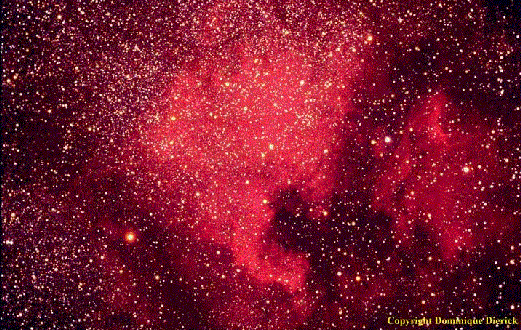 There is a beautiful region of nebulosity up and to the left of Deneb which is visible with binoculars in a very dark and clear sky. 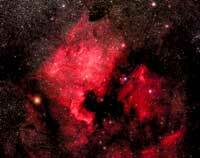 Photographs show an outline that looks like North America - hence its name the North America Nebula. Just to its right is a less bright region that looks like a Pelican, with a long beak and dark eye, so not surprisingly this is called the Pelican Nebula. The photograph below shows them well. Brocchi's Cluster An easy object to spot with binoculars in Gygnus is "Brocchi's Cluster", often called "The Coathanger",although it appears upside down in the sky! Follow down the neck of the swan to the star Alberio, then sweep down and to its lower left. You should easily spot it against the dark dust lane behind. The Square of Pegasus is in the south during the evening and forms the body of the winged horse. 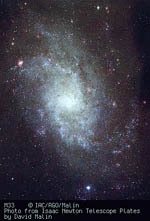 The square is marked by 4 stars of 2nd and 3rd magnitude, with the top left hand one actually forming part of the constellation Andromeda. The sides of the square are almost 15 degrees across, about the width of a clentched fist, but it contains few stars visibe to the naked eye. If you can see 5 then you know that the sky is both dark and transparent! 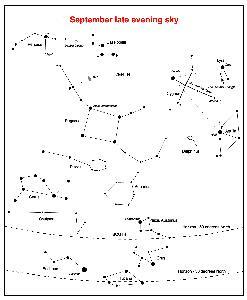 Three stars drop down to the right of the bottom right hand corner of the square marked by Alpha Pegasi, Markab. A brighter star Epsilon Pegasi is then a little up to the right, at 2nd magnitude the brightest star in this part of the sky. A little further up and to the right is the Globular Cluster M15. 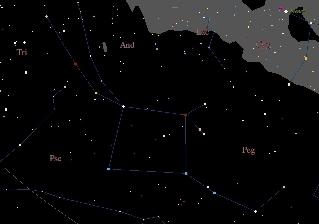 It is just too faint to be seen with the naked eye, but binoculars show it clearly as a fuzzy patch of light just to the right of a 6th magnitude star. The stars of Andromeda arc up and to the left of the top left star of the square, Sirra or Alpha Andromedae. The most dramatic object in this constellation is M31, the Andromeda Nebula. It is a great spiral galaxy, similar to, but somewhat larger than, our galaxy and lies about 2.5 million light years from us. It can be seen with the naked eye as a faint elliptical glow as long as the sky is reasonably clear and dark. Move up and to the left two stars from Sirra, these are Pi amd Mu Andromedae. Then move your view through a rightangle to the right of Mu by about one field of view of a pair of binoculars and you should be able to see it easily. M31 contains about twice as many stars as our own galaxy, the Milky Way, and together they are the two largest members of our own Local Group of about 3 dozen galaxies. the small faint constellation just below Andromeda. Start on M31, drop down to Mu Andromedae and keep on going in the same direction by the same distance as you have moved from M31 to Mu Andromedae. Under excellent seeing conditions (ie., very dark and clear skies) you should be able to see what looks like a little piece of tissue paper stuck on the sky or a faint cloud. It appears to have uniform brightness and shows no structure. The shape is irregular in outline - by no means oval in shape and covers an area about twice the size of the Moon. It is said that it is just visible to the unaided eye, so it the most distant object in the Universe that the eye can see. 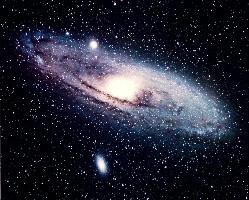 The distance is now thought to be 3.0 Million light years - just greater than that of M31.